Design an internship program with specific goals, duties, training plans and a direct supervisor. Determining details such as these early in the process before the intern begins will make the internship more successful for both your company and the intern. It will help reduce confusion and will give the intern a clear understanding of his or her role and expectations. Determine payment, if any. Sometimes larger companies can get away with unpaid internships because the experience is very valuable. Small businesses can often recruit high-level talent if the can afford to pay interns. To learn more, you can refer to criteria for unpaid interns as described by the National Federation of Independent Business(NFIB). Look for quality candidates. 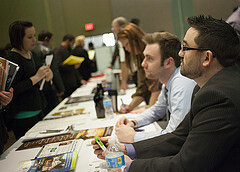 College career fairs are great places to recruit talent. You can also contact the career development offices at local colleges and universities. Look for candidates that are well-prepared, are interested in the company and position, and are willing to learn. Other beneficial skills and abilities include communication skills, organization skills, and being able to work as part of a team. Prepare them for success. Explore the intern’s interests to see how they can fit into the position. While the will have a direct supervisor, try to provide them with someone closer to their level, such as another intern, who can support them and help them adjust. Consider their ideas when making decisions to help them feel valued. Finally, provide regular feedback to interns to help them grow and develop in their professional careers. ← Why is Customer Experience So Important?